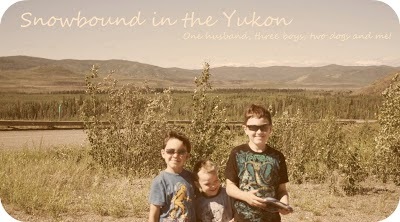 Snowbound in the Yukon: It's been awhile.. But I'm here. I just find that now that it's nice, I'm out most of the day walking or doing errands. We did our speedy trip to Edmonton and bought a new vehicle a Toyota Sienna. I love it, it's roomy and nice to drive. The trip itself was tough. The drive to the city and the plane ride to Edmonton wasn't too bad but once we landed all hell broke loose. SmartGuy just wouldn't sit still and had to check everything out and wouldn't listen. Little M who follows everything his big brother does followed suit with the not listening. Just the whole trip they seemed like they were on some sort of high and couldn't wind down, it was so stressful. We arrived in Edmonton Monday night. Basically we just got our rental and went to our hotel checked in a went to bed. The next day we did a bit of wondering and visited Hubby's mom but Hubby wasn't feeling that great and we stayed in mostly. Wednesday we looked a vans, test drove one and picked it out. Did the financing stuff and drove away with our vehicle by 5pm. Visited hubby's oldest son and then went and crashed I think. Thursday, we did more wondering, some shopping, some visiting and then hit the road around 4:30. That night we stopped at Fox creek after driving through snow for 6.5 hours. It was brutal and we sleep pretty hard. The next day we were on the road by 9am after a good breakfast. We stopped that night at around 9pm at Northern Rockies Lodge. It was quite nice because before that we had stopped at Toad River or Creek and the place was pretty run down and we didn't stay there after looking at a room. We were quite pampered at this place, we all showered and went to bed at a decent hour and were on the road the next morning by around 9am again. This time we drove all the way to Whitehorse, did a few errands and then drove home, we got in very close to midnight but we were home and very happy to be. Since then, I've been busy walking with my new double stroller. I love getting out with the boys and I'm sure Little M is loving it. We even walked the Dome one day. It's the old road on the mountain behind us. I has a road that goes up to the subdivisions and since there are two roads that join it's called a loop since you climb up once side of the hill and come down on another side just outside of town. It's quite a walk. I did it with two friends, I'm too afraid to do it by myself since bears are known to live on the mountian. I celebrated my 32nd Birthday yesterday and it was really quite uneventful and I'm actually alright with that. Strange but I am. I'm having a barbecue with my family on Saturday and thinking I may invite my friends over for a barbecue next weekend. That should be fun! I hardly ever get to get on my computer every day. I do manage to look at email but can't seem to write back or answer much the boys occupy my time so much. SnowBaby is doing great, he started rolling over while we were gone but hasn't done it since we'ver been home, little stinker. I'll try to post some pictures later. I finally dealt with my headache issues and saw the doctor, she gave me some pills to take for five days to try and break the cycle. I've been having headaches every since SnowBaby was born and I'm not a headache type of person, I just don't normally get them. But I'm getting older and my hormones are constantly changing, so that could be once reason since my hair is falling out like crazy lately. Plus I have a wisdom tooth that is bothering me and it hurts a lot. I feel at times to have a sinus infection, my ears and cheekbones ache. So hopefully I'll see the dentist in the next two weeks and get that sucker pulled out. In the mean time I'll just keep popping pills, not something I normally do either but the pain has become a nuisance.